Aging rock stars never die – they continue to show up in boxed set tribute CDs, reality shows, VH-1 specials, and now, in the case of the Canadian band Anvil, in a wonderfully personal documentary that captures both the passion and hard knocks of the veteran heavy metal rockers ongoing quest for stardom. Directed by Sacha Gervasi (whose writing credits include The Terminal), Anvil! The Story of Anvil!could be easily described as a real life Spinal Tap. But what it really captures – beyond all the outrageous lyrics and fist pumping rock posturing – is the youthful enthusiasm the band still brings to every note they play, an unquenched passion for rock ‘n’ roll glory that began when lead singer Steve “Lips” Kudlow and drummer Robb Reiner first met as schoolboys in Toronto almost three decades ago. 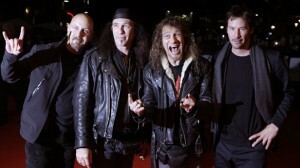 Over the course of their career in the 80s, Anvil was the equal of any heavy metal act, as interviews with Lars Ulrich of Motorhead and guitarist Slash of Guns ‘N’ Roses attest, and their power riffing on albums like “Metal on Metal” influenced every speed metal band that came after them, including Metallica. They toured extensively with mega hard rock acts like Whitesnake and Bon Jovi throughout the eighties but were never able to break through to the widespread acceptance and enter the pantheon of rock gods many of their contemporaries did. But it wasn’t for a lack of trying. Anvil has never given up on their dream, even if it meant playing small local venues and bowling alleys, and in 2006 Gervasi, who had worked as an Anvil roadie when he was 16, decided to track his old band down, and found that their rock ‘n’ roll flame was still burning brightly. In the final analysis, Anvil! The Story of Anvil! isn’t just a film about music. It’s a tribute to the passion and friendship involved in any creative project, an anthem to a personal bond in quest of the rock ‘n’ roll grail. Now, though Kudlow and Reiner are both in their 50s, with family obligations and regular jobs, they still answer the call of their muse, playing concerts like the one in the film with limited budgets touring smaller markets, – and like the short play after their film’s Premier in Los Angeles, which was opened by Keanu Reeves who had his own touch of fame with the rock world not too long ago, and as a friend of Gervasi and a fellow Canadian landed support to the band. Kudlow and Reiner are brotherly friends, Reiner being the ultimate drummer, an extraordinary talent, and Kudlow the driving force. I had a chance to chat with Reiner after the show and we both agreed that boiling blooded Hungarians like Reiner “has nowhere to go but up.” He still speaks the language with a funky accent that he learned from his immigrant father and sprinkles his sentences with a great sense of humor. Both Lips and Reiner are the ultimate rock ‘n’ roll optimists, clearly full of the adolescent enthusiasm and passion that fuels all dreams. Life gets harsh when you go off the path, let opportunities slide and find yourself struggling by. Money is scarce and survival is an issue. Things go wrong, the downright spiral is only getting deeper, you tiptow on quicksand with nowhere to go. Keeping the hope, knowing your worth, setting out to show the world is what Anvil does in this very funny and very touching documentary that deserves all the awards there are. An honest portrayal of personal struggles and the human condition in a very humane way, the movie is a must see. “Do not die with your music inside of you” – Anvil certainly did not and what a message that is for all of us!